Most well known for its beaches on the south coast of the Algarve, Portugal has many interesting places to sail the Shrimper. From the River Douro up north with its famous slope vineyards producing the world famous Port Wine, to Lisbon and the 50 miles Tagus estuary extending from its mouth near Cascais to Valada do Ribatejo, to the big lakes of Castelo do Bode or Alqueva dam along the Zêzere and Gaudiana rivers, you will discover wonderfull scenery, mild climate and good hospitality. 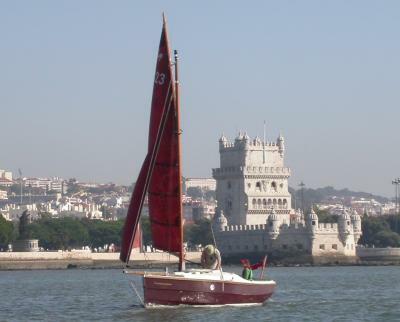 In October 2008 we were delighted with the visit to Lisbon of 3 Shrimpers and a Crabber 22. It is now time to other SOA members to pick boats and trailers and drive south with family and friends. We will happily, welcome you. For more then five years now, 2 boats are sailing in the Tagus and recently another boat is on the quite waters of the Alqueva. Taking good advantage of our southern location, we are fortunate to sail all year round. Sailing with the tide is almost obligatory in the Tagus and as good friends, Corvo III and Crevette, have covered hundreds of miles together. One of the highlights is the summer cruise up-river to the sandy shores of Muge. For 2010 we are preparing to go to the Alqueva, to meet Salamander and explore the Guadiana river.